Royal Mail privatisation: what's happening? "This is an important day for the Royal Mail, its employees and its customers," said Business Secretary Vince Cable today. This, at least, will be a rare point of agreement in an otherwise charged debate over the future of the UK's postal service. The government has announced its intention to float the Royal Mail on the London Stock Exchange. It hasn't said how much of Royal Mail is to be sold, saying "this will be influenced by market conditions at the time of transaction, investor demand and the objective to ensure that value for money for the taxpayer is achieved". However, it still intends to sell the majority of the company. 10% of shares are being set aside for 150,000 eligible employees, who'll be able to get additional shares from £500. Members of the public will need at least £750 to apply. Royal Mail Group collects and delivers about 14 billion addressed letters and over one billion parcels a year. It employs about 150,000 people in its UK branch. 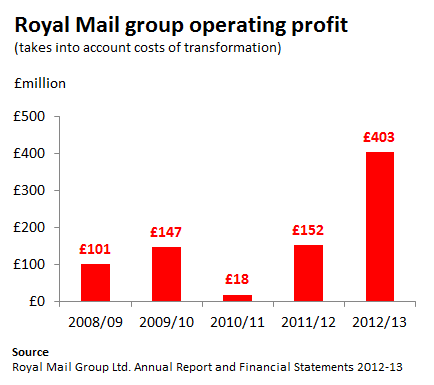 In spite of former financial difficulties, the last few years have seen Royal Mail's operating profits grow. The Coalition Agreement of 2010 set the wheels of the current reforms in motion, committing the government to "ensure an injection of private capital into Royal Mail, including opportunities for employee ownership". The reforms were eventually realised in the Postal Services Act 2011. This separated Royal Mail and the Post Office into sister companies, as well as transferring Royal Mail's pensions deficit to the government and changing its regulator from Postcomm to Ofcom. Regulation changes will still impinge on Royal Mail even after it's floated on the stock market. In particular, the service will still be required to provide a universal postal service. At the same time, Ofcom has required that post boxes remain accessible within half a mile to 98% of delivery points in the UK. "HM Government is taking action to secure a healthy future for the Company. These measures will help ensure the long term sustainability of the six days a week, one-price-goes-anywhere universal postal service." "will inevitably threaten the public interest, from the moment the sales process starts to the long-term future of both Royal Mail and the Post Office. Public ownership of the Royal Mail provides the ultimate safeguard for the public interest." Today the Shadow Business Secretary once again voiced the party's opposition to the move, and cited the Countryside Alliance, the National Federation of Subpostmasters, the Conservative Bow Group, the Business, Innovation and Skills select committee and Royal Mail employees as being opposed to the measures. However, the Countryside Alliance have since contradicted this, saying it has "no interest in either opposing or promoting privatisation of the Royal Mail". Furthermore, the BIS committee is yet to report on the reforms. Finally the Communication Workers Union is also opposed: a ballot of its members in June this year found that 96% opposed privatisation on a 74% turnout. There haven't been many polls on the public's support for privatisation, but one was conducted recently by YouGov. It found that when asked whether they would support or oppose plans to privatise the Royal Mail, 20% supported it and 67% were opposed. How generous are firefighters' pensions? Are pubs faring well, or are they bidding farewell? Did lending to businesses fall by £14 billion in the last year?